of other applications, Human Anatomy Encyclopedia has buttons with the names of organs along an organ system. Just click on the button with desired name and the application will show you the body part in green color. You can also hide the organ or unhide it. The application shows and interact on 3D Models for each organ systems unlike other anatomy applications that show only pictures. You can move, scale and rotate the model and if you lose your original position you can click on "Refresh" button and it places the model in the original position. The application has detailed audio pronunciations of each organ. You can mute and turn on the sound as you wish. It has "Share" button where you can share this lovely application in 29 different ways like: Gmail, Yahoo Mail, Droppbox, Google Drive, Messenger, Skype, Whatsapp, Youtube and more. We will be happy to receive any comments, suggestions, bugs and improvements, to davidhalbi11@gmail.com all will be treated seriously and promptly. 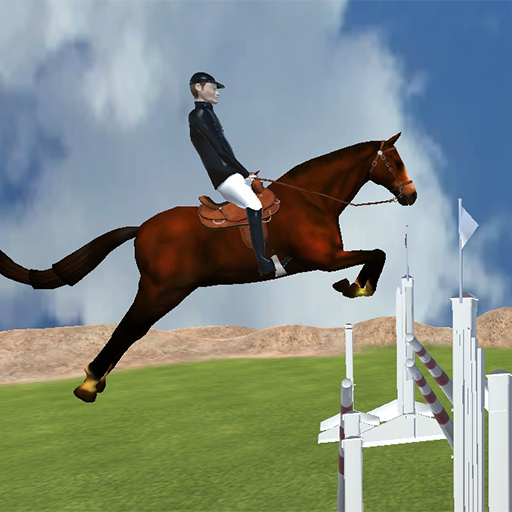 Easy Horse Jumping - Show Jumping Game. Just tap on screen and start jumping. horse. Level time is 60 sec. The thrill of the races right in your pocket. Ether you're a fan of the steeplechase, horses or just fast pace mobile games you're sure to love riding your horse in this 3d game of timing. The game play is easy enough for children to play to, just tap the screen to jump your horse over hurdle after hurdle. Score points by jumping over hurdles successfully, miss your hurdle and they break away with realistic physics. Each round lasts one minute, but you will have hours of fun trying to beat your high score. Saddle up and download Steeplechase today! Pop flying chickens in the sky and get 15 points. Pop an airplane and balloon and get 100 points.Chicken hunter Well, dag-nabit looks like the chickens got loose again and now they're all over the farm! That's OK though because that means now you can play Chicken Hunter, the fast paced 2D action shooting game for Android. Blast your way through wave after wave of chickens, hot-air balloons and bi-planes. 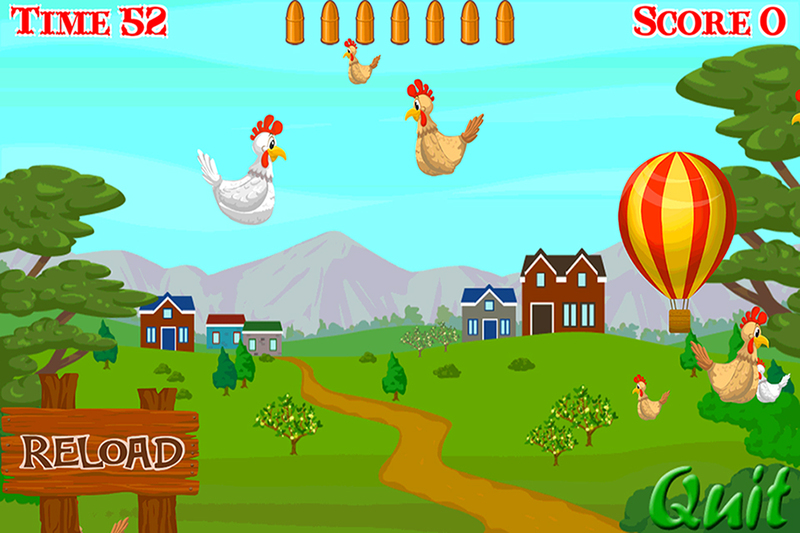 The simple controls and game play make Chicken Hunter as kid friendly as the cute colorful graphics. Simply tap the screen to shoot all the birds, airplanes and hot-air balloons you can in one minute to score enough points to pass the level. Tap the sign to reload your gun and blast away some more. Chickens are work 15 points hot-air balloons are 100 and if you manage to take down a plane by shooting it three times, they're worth 100 as well. Levels get harder and harder until the screen is covered in targets. Can you shoot your way through all the levels to win the game? Can you beat the high score? You can find out now, because poultry is on the menu and so is this additive free game for Android! Dolphin slides and jumps on waves. Dolphin collects gems, coins and stars for 5 points each. When Dolphin makes a big jump. Time of the game is 120 sec. Dolphin Flys over the waves.Have you ever dreamed about being a wave jumping dolphin? 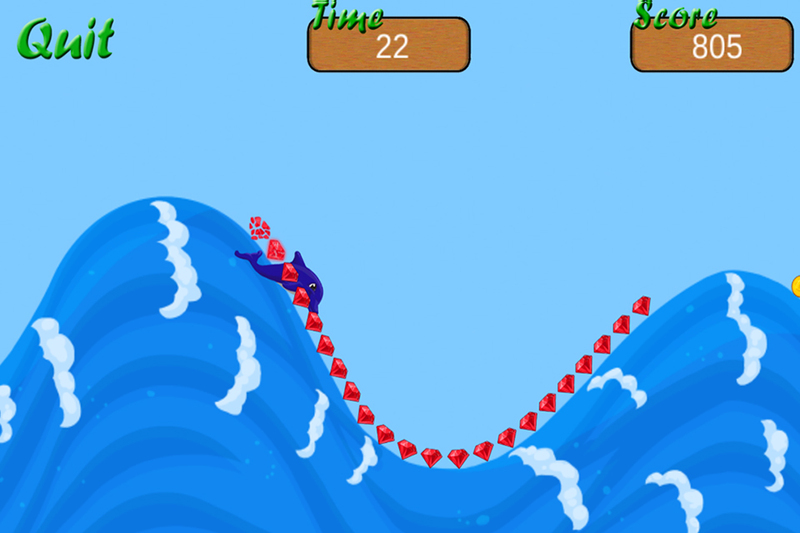 Well you don't need to dream anymore because now there's Dolphin Jump, the latest slope jumping game for Android. Collect gems, coins and stars for points while you ride the waves as a free spirit surfing dolphin. The controls are very simple, just touch anywhere on the screen to dive down and gain speed on down slopes and release to ramp up the waves on your belly. Slingshot yourself up and away into the air a score a SWOOSH! worth 100 points. While easy to learn it's difficult to master hitting the waves just right to collect all the coins. Download and play for free this exciting game for dolphin lovers of all ages. Just move the finger on the screen and start swimming. Dolphin swims escaping from bombs, crates, jellyfish, octopus.Earn points with gems, coins, stars, clam shell, box with a gold. Jump through the hoops. Seahorse and fishes are just decorations. Looking for an addicting game that is fun for kids and adults alike? Dolphin run is a game made just for that porpoise. Guide the cute dolphin how to collect gems and treasure while avoiding dangerous octopus mines and debris how many Hoops can your dolphin jump through? how many points can you score before the timer runs out where you get knocked out by the Sea Baddies? Download this free game and find out now. Kids will love dolphin swim because it's easy to play and there's loads of cute colorful animals. I don't have a fun time playing this infinite Runner as well. Simply move your finger up and down the screen to control the dolphin and navigate through the sea as it swims, collecting treasure and doing tricks on the way. Tap the jump button to leap in the air through hoops for extra points. You have one minute to collect all the gems, coins, pearls, treasure, stars and hoops you can to try and best your high score. Don't let the octopus sea mines or crates hit you three times though, because they will knock you off track and end your run early. Don't mind the schools of fish, starfish and seahorses, they're just floating by to say hi. 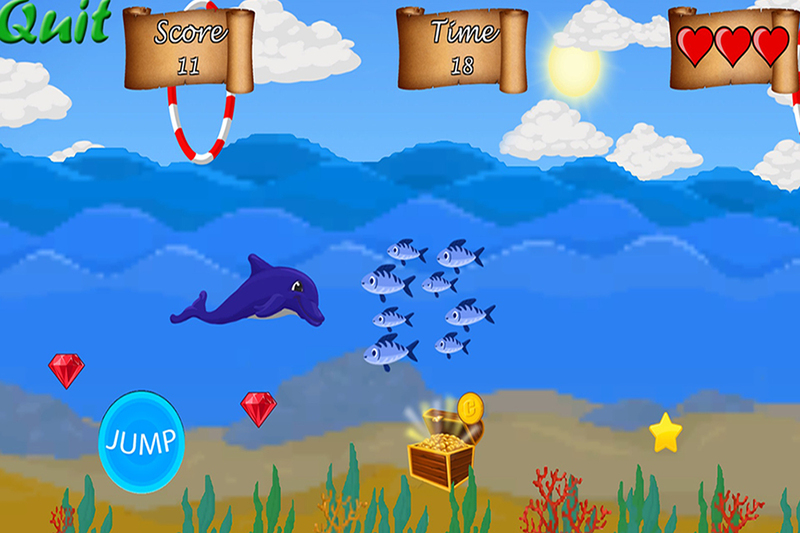 If you're looking for a family freindly game thats fun to play, download Dolphin Run today! Dragon Runs over the platforms and jumps between platforms. Dragon jumps over the fire, snake and hedgehog. If dragon touches them it gets -100 points. When dragon catches fruits like banana, apple, ananas, grapes it gets 100 points. Game ends when dragon doesn't succeed to jump over the platforms.Want to play a fast paced side scrolling infinite runner game for Android that will leave you fired up for more? Then Dragon Run is the app for you. As a cute blue dragon, you'll run faster and faster, jumping across platforms while trying to avoid falling through the gaps. Eat fruits on the way to gain points and avoid snakes and hedgehogs who want to slow you down and steal your points. Most dragons like fire, but not this one. Run into a fire and YIKES!, it will send your dragon leaping through the air. 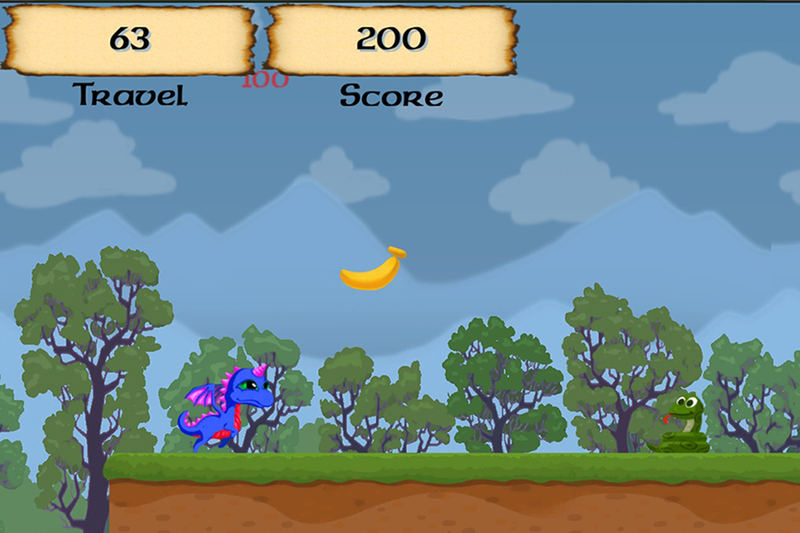 Dragon Run is a great game for kids because the controls could not be any more simple and easy. Just tap anywhere on the screen to jump. Play for points or distance or both. Try to beat the high score and distance, play with your friends and beat theirs. However, be warned once you download and play Dragon Run, you will find the most challenging part of this game is putting it back down. Fox - Thief. The fox catches eggs on the farm. Each caught eggs gets 1 point. To move between chicken nests tap on the green buttons.Egg mania There's a fox in the henhouse in this rendition of the classic handheld game of reflexes. You've got to pay attention and stay on your toes if going to have the concentration to collect all the eggs and win. 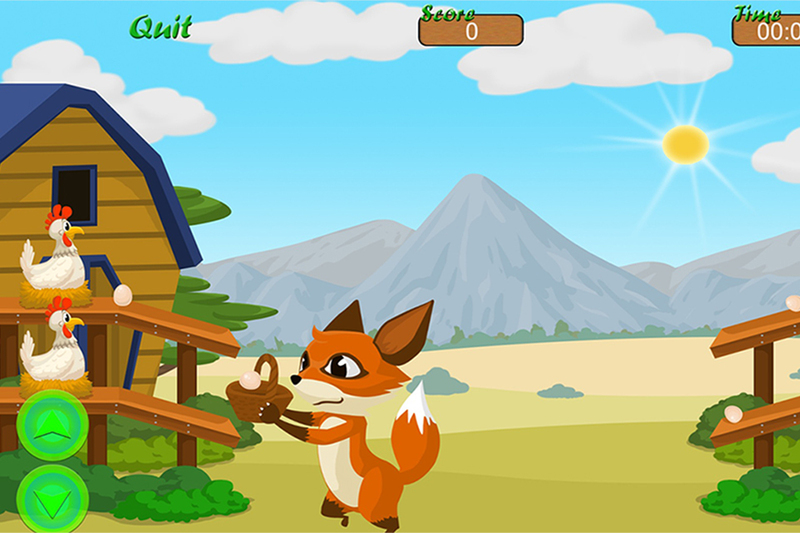 The game is as simple as it is fun, just tap the four corresponding buttons to move the fox into place to collect the eggs as they fall from the chickens. look out, as soon as you catch one egg, here comes another from a different chicken. Don't let the eggs drop or they'll hatch into chicks and run off. 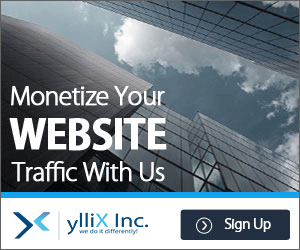 Kids will love the cute 2D cartoon graphics, adults will be addicted to the fast paced action. Young and old alike will be caught up in Egg Mania the latest down home farm game for Android! Copyright © 2007 Shark Software. All Rights Reserved.